Wings are a popular weekend dinner in our house. 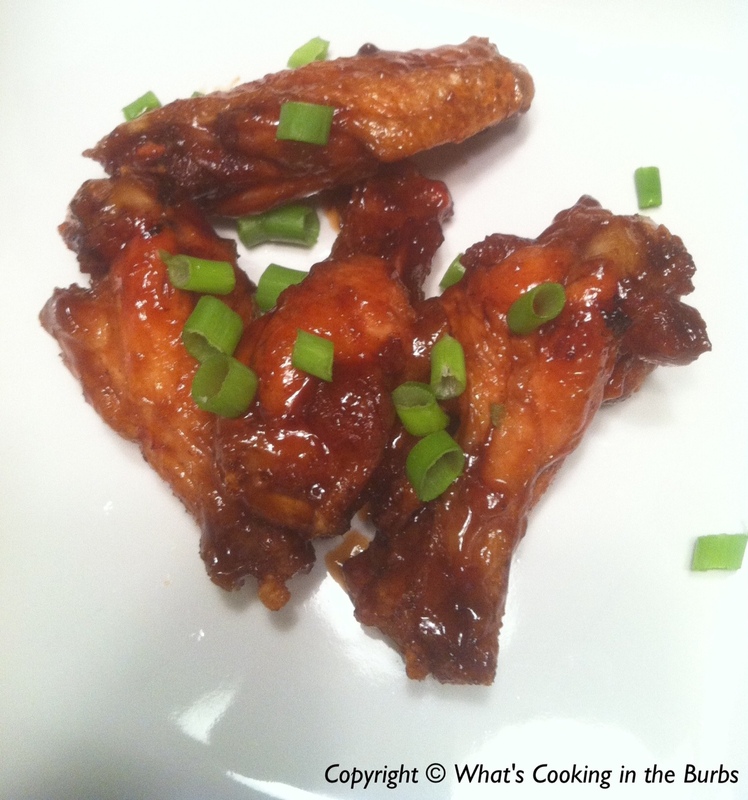 A few months back I made a baked boneless buffalo wing recipe that turned out great, but this time around I wanted to try out a bone in recipe. Both my husband and I love Asian Zing wings from Buffalo Wild Wings. I love the sweet and spicy sauce. I wanted to re-create the wings at home but bake them instead of deep frying. I found a recipe on the food network that I thought might taste similar to our favorite wings. Both my husband and I were impressed. They were delicious! Heat oven to 450 degrees F. Spray a large baking pan with non stick cooking spray. Combine green onion, honey, soy sauce, chili sauce, sesame oil, ginger and garlic in large bowl. Add wings; toss to coat. Place wings with sauce in single layer in prepared baking pan. Bake, turning occasionally, 25 minutes or until chicken is evenly browned. Increase oven temperature to broil. Broil wings 6 inches from heat, turning occasionally, for 8 minutes or until sauce is thick enough to coat back of spoon. Remove wings to platter; spoon sauce over. Sprinkle with green onions. Enjoy! YUMMY! These look so good! Saw you at Saturday Show & Tell! Thanks for coming over to Super Sunday ;) Hope to see you next week!